But that wasn’t all. The figure of 84.6% also topped the 83.9% record for a turnout in a UK general election, set back in 1950. The highest turnout in the 32 electoral regions across Scotland was recorded in East Dunbartonshire: a mighty 91%. Other highs included East Renfrewshire (90.4%) and Stirling (90.1%). Fewer people went to the polls in some of Scotland’s urban centres, such as Glasgow (75%) and Dundee (78.8%). 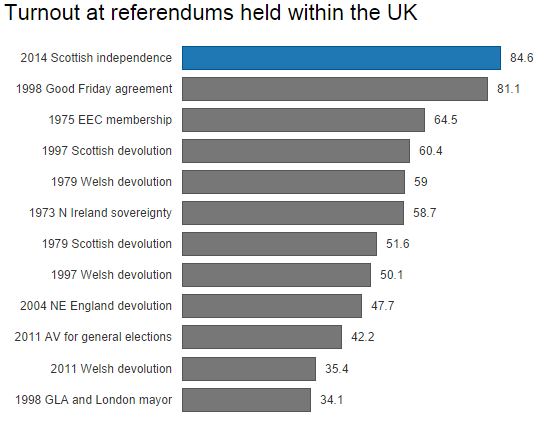 For the referendum to attract a higher turnout than even the Good Friday agreement is remarkable. If nothing else, Thursday’s vote is proof that deciding the future of your country through the ballot box is a principle that retains mass appeal. It’s also knowing – in stark contrast to a general election – that every vote counted equally. There is some analysis at the House of Commons Library blog of how wrong the polls were. See http://commonslibraryblog.com/2014/09/19/how-do-scottish-referendum-polls-compare-with-the-result/ They are planning to publish further analysis next week. And here is the further analysis. The correlations are interesting.